Whatever gifts you have been blessed with by God, you cannot fully realise their value until you become one of the Anointed. In his latest book, Pastor Oghenethoja Umuteme explains how you may become Anointed in order to excel in your purpose on earth and carry out God’s purpose. 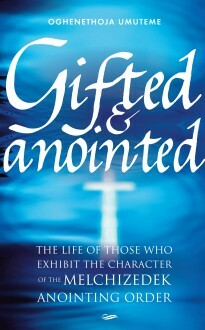 Gifted and Anointed is an insightful and revelation-packed teaching about the character of the Melchizedek Anointing Order. Pastor Umuteme explains how anointing brings God’s care and protection and attracts the spirit of God. Being anointed will enable you to succeed better in your chosen path in life as well as to serve God better. Memoirs has also published Pastor Umuteme’s last three books, The Man God Made, Aspects of Marriage and Leadership: An Eagle Eye Perspective.